How Dangerous are Digital X-Rays to Your Health? We’ve heard of the risk that x-ray radiation is harmful to us. So how harmful are your dental checkup x-rays? Radiation from space in Denver, Colorado – 0.510 (per year) Yes, there was an actual study on this! So essentially, you get about three and a half times the radiation from space (if you live in Denver) than you do from a full mouth X-ray. It’s about an extra 115 millirems of extra radiation per year in Denver. Remember, we have radiation everywhere, from our computer devices to outer space, that is constantly sending radiation to our cities. X-rays do tend to get a bad wrap for radiation and health concerns, but when done digitally, there are many benefits. Quality – we are able to resize and zoom in on the images without distortion, which helps us to diagnose problems in earlier stages and; therefore, leads to more conservative, less painful, and less expensive procedures. Now, not all dentists have digital x-rays because honestly, they are expensive! But we think it’s worth the cost! Remember the radiation you get from dental X-rays is pretty insignificant. You receive more radiation by just “living” than you do by going to your dentist. 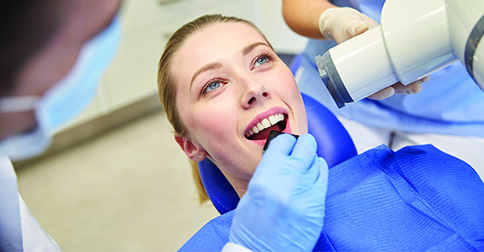 So don’t let fear keep you from good dental health of getting an x-ray once in awhile. And for extra safety, we still use the crazy heavy x-ray vests to isolate the area of an x-ray to guard you from the barely exposed radiation there is!